My City Centre Masdar ... an artist’s impression. Majid Al Futtaim, a leading retail and leisure pioneer in the region, plans to set up a new Dh300-million ($82 million) shopping destination in the heart of Masdar City in Abu Dhabi, UAE. The flagship sustainable urban facility located next to Abu Dhabi International Airport is being developed by top UAE renewable energy company Masdar. The My City Centre Masdar mall will feature 60 outlets spread across 18,000 sq m of gross leasable area (GLA) including a 5,760-sq-m Carrefour Hypermarket, a Magic Planet family entertainment centre, a City Centre Clinic to provide community-focused healthcare services, and convenient dining options within Masdar City. Set to open by the end of 2018, My City Centre Masdar will deliver a convenient, neighbourhood retail experience to meets the daily shopping needs of more than 75,000 estimated consumers in surrounding areas. It will have easy connectivity to planned smart public transport options including buses, light rail transit (LRT) lines, Group Rapid Transit (GRT) vehicles and the metro network. Today around 2,000 people work at Masdar City and its residential population is expected to exceed 3,500 people within the next two to three years. Around 35 per cent of the city’s planned built-up area will be completed over the next five years and nearly 30 per cent has already been committed to, including private homes, schools, hotels and additional office space, said the developer. Up to 40,000 residents and 50,000 workers and students are expected to be based at Masdar City by 2030. 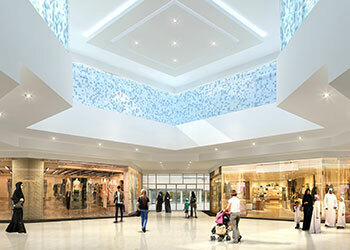 The one-level mall, to be constructed to Majid Al Futtaim’s international sustainability standards, will have shaded parking for 430 vehicles on its rooftop through the use of photovoltaic panels, with My City Centre Masdar’s energy and water consumption targeted to be 40 per cent lower than comparable buildings, in line with Masdar City’s eco-friendly strategy. “The mall will aim to achieve an Estidama Three Pearl rating, which is the equivalent of Leed Gold building status for sustainability,” said Ghaith Shocair, the chief executive (shopping malls) at Majid Al Futtaim Properties.